I’m a woodworking hobbyist, and my idea of a perfect weekend is hours spent in my little shop turning pieces of wood into smaller versions of themselves. For myself, and others like me, this is our favorite pastime. It is unfortunate that our beloved hobby has to come hand in hand with the nasty, carcinogenic by-product…sawdust. 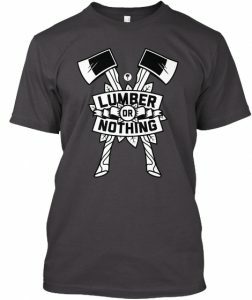 If you’ve spent as much as a few minutes in a woodshop you’d probably know, the struggle is real! That’s why hobbyist, like myself, often use shop vacs to combat the scourge that is sawdust. 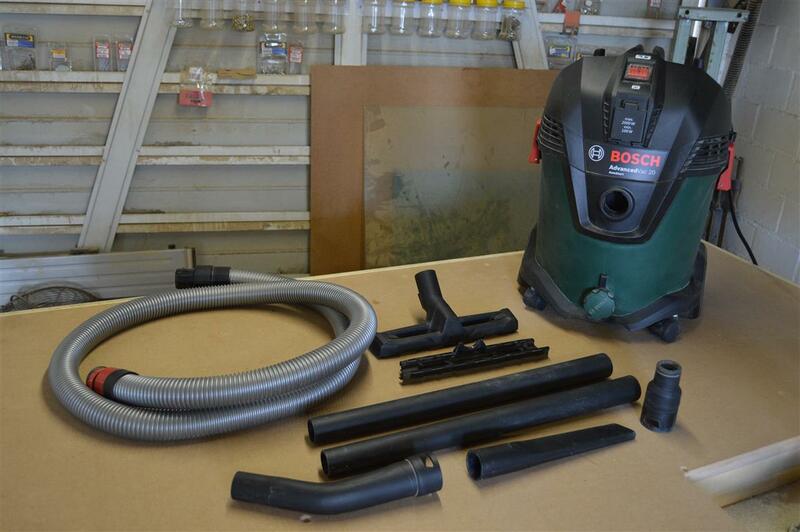 In my case, I opted for the very affordable Bosch AdvanceVac 20. Mostly to get a handle on the dust in my small home workshop but also as a vacuum to use for a number of tasks in and around my home. To following is my detailed review of this BOSCH product. The first thing you will notice about the AdvanceVac is the color. Yes, it’s green. Which means that the 230V DIY duty shop vac is only available in EU countries and sadly not in the USA. Beyond the green bucket, you’ll notice a 3 stage switch for ON, OFF, and AUTO. (More on that in a moment). You’ll also notice a power socket with 2000W MAX printed on it, a green water drain knob at the base of the bucket, and in bold red letters a reminder that this shop vac is, in fact, a BOSCH product. The body of the AdvanceVac 20 comes together on top of a bulkier, bumper-like chassis with two small caster wheels in the front for steering and two much larger wheels at the back for stability. In addition to the drag racer look, the chassis also has storage space for all the attachments supplied with the AdvanceVac 20. The AdvanceVac 20 offers a 20L impact resistant, non-rusting, container for wet/dry vacuuming with a 13.5L liquid capacity. At the base of the container is an easy to unscrew drain knob for draining liquids from the bucket. The AdvanceVac 20 also offers a blowing function with the blower port situated on the reverse side of the vacuum. 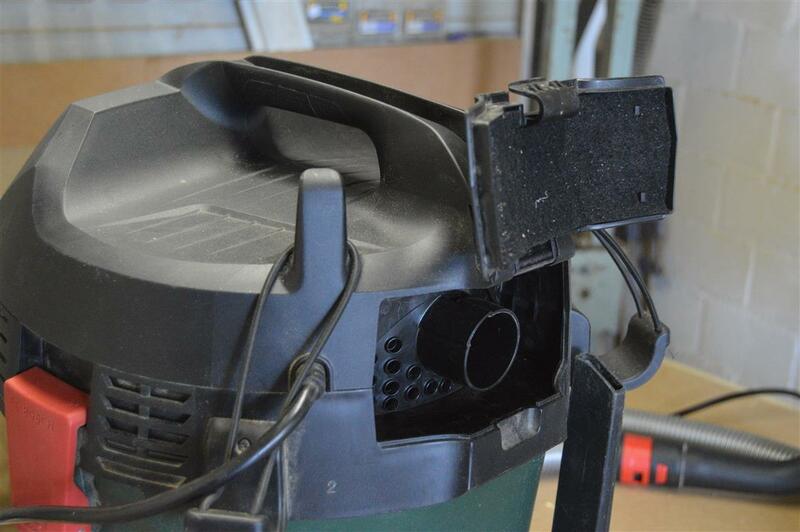 The blower port gets neatly concealed by a clip-in-place louver when not being used. Attaching or removing the hose from the vacuum/blower ports is done with an effortless push-twist or twist-pull motion. The AdvanceVac 20 can be used as a dust collector with most power tools (that allow for dust collection) by simply attaching the vacuum hose to the tool using the universal adapter (supplied). With onboard attachment storage, and weighing only 7.6kg, the AdvanceVac 20 can be easily carried around or even rolled around to where it is needed. The most exciting feature (and the reason why I bought mine) of this BOSCH product is the auto-start function. 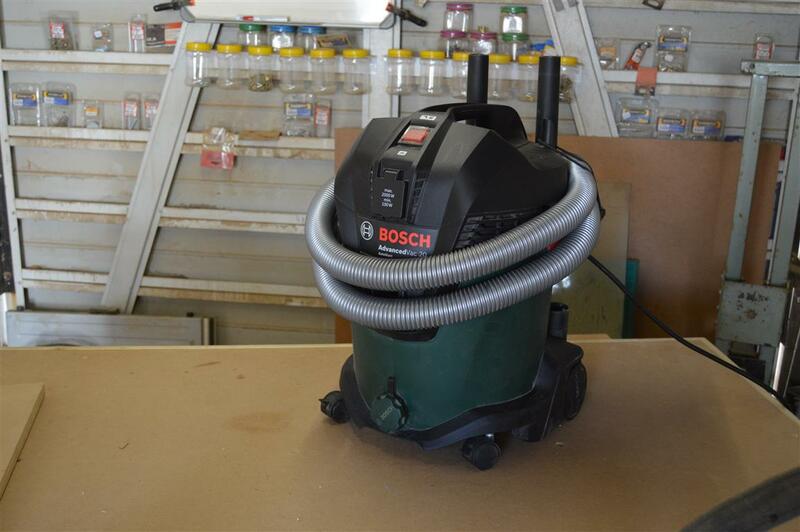 The auto-start is what makes the Bosch AdvanceVac 20 the ideal shop-vac for the weekend warrior woodworker like myself.  Need to do some cutting or sanding? Attach the suction hose to the power tool in question (Jigsaw, circular saw, sander, etc.) via the universal adapter supplied with the vacuum. Then, plug the power tool into the socket on the AdvanceVac 20 and switch to auto. The result will be the automatic startup/stop of the shop-vac when the power tool is switched on/off. The auto-start socket on the AdvanceVac 20 can handle a load of up to 2000W with a minimum trigger value of 150W. This means it can even be used with larger equipment like most miter saws or contractor saws while not being triggered by things like laser guides or built-in work lights. Who was the AdvanceVac 20 made for? For people like us. 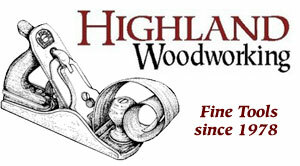 The woodworking hobbyists and DIY’ers. 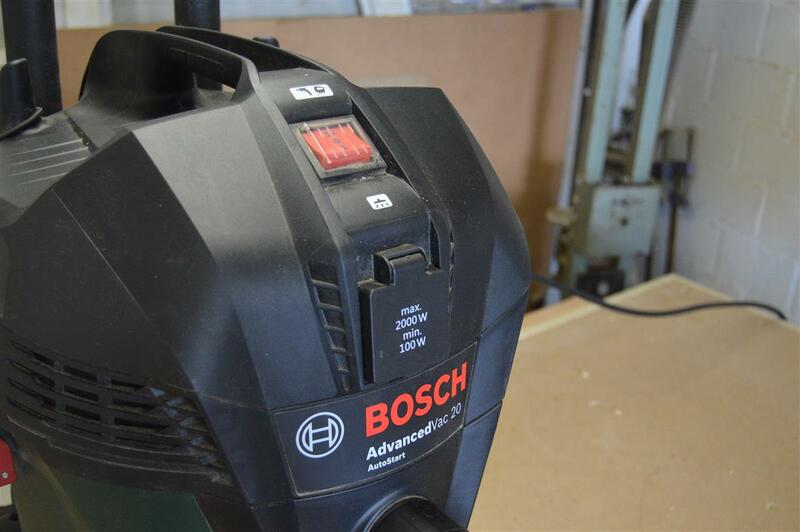 It may not be the most powerful shop-vac on the market but with the AdavanceVac 20, BOSCH, one of the world leaders in power tools, offer people like myself a cost-effective space-saving way to get a handle on the dust and shavings in our small woodshops. Other products in this BOSCH series. The AdvanceVac 20 is the largest and most powerful of the four vacuums in the series. Others include the UniversalVac15, the EasyVac3, and the EasyVac12. The UniversalVac15 is in many ways a slightly smaller version of the AdvanceVac 20. It’s more compact but sacrifices a bit of power for it. It also does not have the auto-start function. The EasyVac3 is the smallest, least powerful, of the 3 corded shop-vacs in the series. It can even be considered a bench top shop-vac as it only weighs 4.3kgs and is very easily moved around. The EasyVac12 is the only cordless vac in the series. It is a handheld vacuum with 22min run time while being powered by a 12V 2.5Ah battery.